The Dietz Little Wizard Camping Oil Lantern has been in production since 1926, known then as "Little Giant". The large 32 ounce tank prevents toppling. 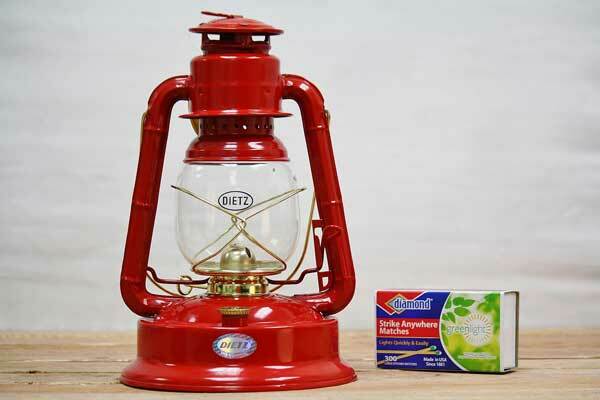 This old fashioned oil lantern is particularly well designed for emergency lighting or any time a steady, medium-bright light is necessary. With a burn time of 45 hours it was designed to stay light all night. These oil lanterns are popular for tug boats carrying heavy loads up winding rivers. Suitable for operation indoors and out. Convenient lever lifts globe assembly lift to easily light and trim the wick. Made by Dietz Lantern Company. Can I burn tiki torch oil or Citronella oil for bugs in a lantern?? ?